Advantages of having a gas stove in your home include improved energy efficiency, precise temperature control, immediate heating and cooling, lower operating cost and the ability to work without power. There are many different styles and sizes to choose from. Jøtul gas stoves offer both classic timeless looks along with clean, sleek modern looks to complement any home. Heat & Glo gas stoves offer clean, high-efficiency heating while creating a rustic and inviting atmosphere. Find your perfect model and transform your living space. Lopi Gas Stoves feature realistic detailed logs sets and embers with the option of multi sided views. 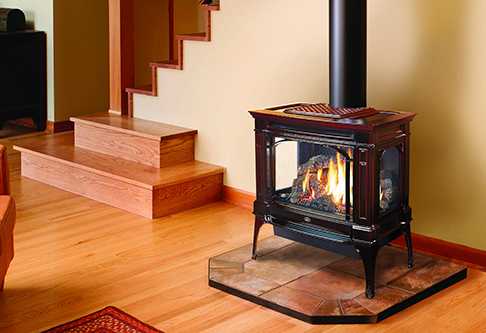 Pacific Energy stoves are engineered to provide powerful, efficient heat for your home. Large aluminum-finned heat exchangers result in high performance.